Welcome to the April Grocery Trader. As the Easter break approaches, here’s to getting the chance to relax a bit this month ahead of the long weekend! Meanwhile it’s springtime for the retail sector. According to the ONS, February saw consumer spending in retail increase 3.5% against last February and 1.3% compared with January. As we move further into multi-channel retailing, UK spending online increased 12.4% in February versus last year, and by 2.5% on January. Retail packaging has never been more important in both protecting products in the supply chain and exciting consumers at the point of sale. In our Retail Packaging feature we look back at the recent Packaging Innovations show at the NEC, and the latest innovations from the packaging manufacturers and designers. As the weather gets warmer and consumers get more relaxed it’s time for our latest Big Night In feature, highlighting some of the sharing products available to help shoppers relax with friends and family. Easter is of course a Mega Night In, in sales terms! The Easter break runs from the evening of Thursday 17th April through to Monday evening, 22nd April, the second biggest holiday blitz after Christmas – just what the trade needs after the long, wet winter. There are plenty more opportunities coming up for retailers to boost their Big Nights In business over the next few months, particularly the World Cup. As our front cover lead story reminds us, spring means time to think about the great outdoors, but you don’t want to be stuck there with a flat battery! As Britain’s supermarkets and Co-ops step up their non-food offering, Exide has recently launched the 12/7 Intelligent Battery Charger into the multiple grocery sector. It works for all types and sizes of 12V batteries, including those for cars, motorcycles, boats and caravans. The device covers over 35 million UK vehicles, all from a single SKU. 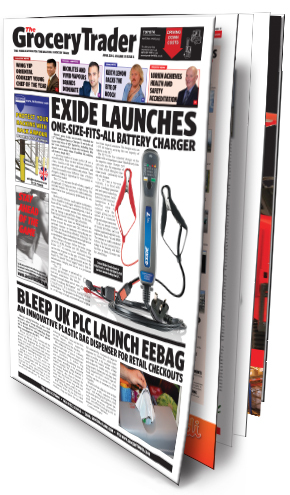 As Craig Everett, UK marketing manager, Exide Technologies explains, the 12/7 charger is designed to sell in a wide range of retail environments and appeal to a broad range of consumers. In our other cover story Bleep PLC is launching the Bleep eebag to the retail industry after unveiling it at the recent Retail Business Technology Expo 2014. Designed to reduce stores’ plastic bag consumption by 40%, eebag is an innovative plastic bag dispenser developed to integrate into checkouts and reduce retailers’ plastic bag consumption by controlling and limiting the release of bags. New to the UK, eebag is in over 6,000 operating points globally, and is designed with the impending plastic bag levy in mind, where a charge will be incurred for using plastic bags in all UK supermarket and large stores.